The White House Needs an Injection of Calm Trump is an unusual character. He’d benefit if his staff included some conventional ones. Most people don’t live near Washington. They’re not connected to it. They see a new White House on screens—computer, TV. They don’t listen to all the chatter but sometimes turn the sound up. Nothing about the story of Mr. Flynn is satisfyingly clear. Most people would say discussing the views of the incoming administration with the Russian ambassador would be an anodyne act—harmless, maybe even helpful. But few know exactly what was said. That he misled the vice president about discussing sanctions is bad. That the vice president later vouched for him is embarrassing. That Mr. Flynn’s phone conversations were subject to surveillance is strange. That information about the call or calls was leaked to the press is unprecedented. 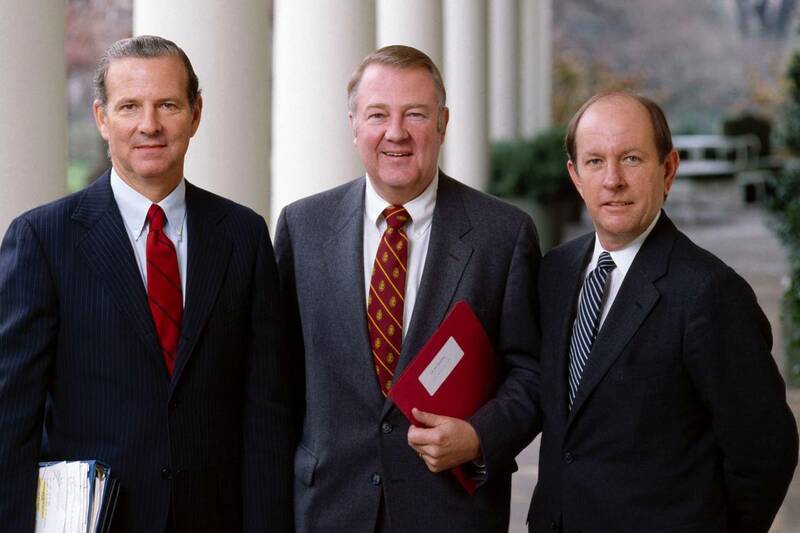 Reagan staff members James Baker III, Ed Meese and Michael Deaver at the White House in 1981. Is this, as some suggest, “deep state” revenge for the haughty, dismissive way Donald Trump spoke of the U.S. intelligence community during and after the campaign? Is it driven by sincere and legitimate anxieties that the new White House has an unknown relationship with Vladimir Putin’s government that potentially compromises U.S. security, independence of judgment and freedom of action? Is it driven by the antipathy of the permanent government toward Mr. Putin, and a desire to bring down those, like Mr. Trump, who hope for closer relations with Russia? Is it that they’ve seen—and listened to—enough of Mr. Trump to think he’s a screwball, period, and a threat to the republic? It is a terrible thing if suddenly, in America, there is a government within the government that hates the elected government—and that secretly, silently, and with no accountability, acts on it. The Trump administration should shock everyone by demanding a major congressional investigation into the whole dangerous mess. The White House ought to welcome the opportunity to clear the air on the first question and get to the bottom of—and stop—the second. There’s a lot going against the new White House—the mainstream media, the spies, the antic nature of the president himself, the ambivalence of his own party, the rise of the passionate left. Mr. Baker, in his memoir, “Work Hard, Study . . . and Keep Out of Politics!,” literally offers a step-by-step guide in how to invent and organize a functioning White House. He knew it was a dramatic moment in history and his president had been painted as a dramatic figure—Hollywood actor turned nuclear cowboy who’ll start a war. So he kept the public part of the White House low-key, organized and focused. Not every pot had to be kept on full boil.